After all those Le Mans powerhouses it’s time to get back down to earth. And I’ve shown it’s English RWD brother last LaLD Car Week so you might have a small deja-vu. This one however, wasn’t nearly as exciting as the Talbot Sunbeam Lotus. Here I present you: The 1979 Chrysler Simca Horizon. Again, developed in a stormy period for Chrysler Europe, this one is a little schizophrenic as it was sold under numerous names. Chrysler, Simca, Talbot, Dodge and Plymouth. And with almost a million produced over a period of 8 years you’d expect to run into one now and then. Well... You won’t. I’ve seen so many of these in my youth it’s hard to understand why these all seem to have vanished. Keep in mind it was late ‘70's/early ‘80's though, a period French carmakers developed cars with one starting point: creating a car that had to be replaced within 4 years. If you don’t believe me: Renault has admitted to do so in the period of the R17/R18 and that’s why you see little to none of these nowadays as well. Quality issues after 4 years didn’t prevent this little car to become the European Car of the Year in 1979 though. And Chrysler Europe (Simca) did well 3 years before that with the 1307 winning this prestigious award in 1976. Another car you won’t see driving around on the road anymore. This probably just was the malaise era for French carmakers. Totally in line with American carmakers I suppose. And to relate to this Altaya, the creator of this 1/43 cast, mounted that rear bumper in an odd non-aligned way. Or did someone crash into it without leaving a note? 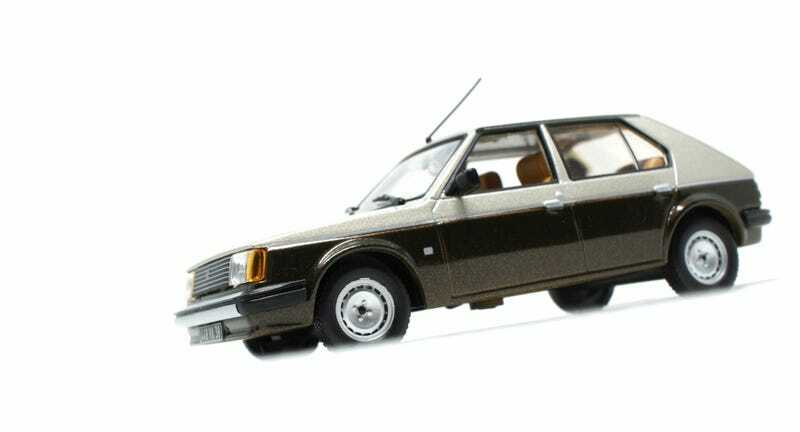 It’s popularity in 1:1 reflects in the diecast market as well: you can easily find this little two-tone edged hatchback for about 6 euros easily. New, mint in box. And I’ll admit: I only did get it to put it next to it’s amazingly awesome RWD brother I mentioned at the start. Still can’t understand both the Sunbeam and Horizon were sold alongside each other. Being an Altaya it comes in a box with the photo back drop and specifications on the rear of the card. No specifications that impressive, this Chrysler Simca Horizon Jubilé was equiped with a 1442 poissy engine. Putting out 69 horses. And that took this french econobox to a top speed of just over 150 km/h. No Le Mans beater so to speak. And capable of doing 100 kms on just over 7 liters of fuel. If you took your time. C’est ca! Je l’ai vu une autre poste Vendredi Francaise déjà, Il a été un moment que je ne suis pas le premier. Chapeau! I wish you all the best and show us your French oddities!!! Bon Week-end!